Archaeological investigations undertaken by Wessex Archaeology between 1990 and 2010 in advance of sand quarrying at Groom’s Farm, Frithend, Hampshire, revealed evidence of prehistoric and Romano-British activity on a terrace overlooking the River Slea, a tributary of the River Wey. The site lies less than 1km south of the Roman pottery production centre at Alice Holt Forest. This note provides a summary of the sequence recorded and its overall significance, with the full report and accompanying tables and illustrations available as a downloadable pdf. The quarry site, including the access road, extended east for approximately 1.1km from the A325, and was c. 0.2km wide north to south. Within the site, four largely contiguous excavation areas, centred on NGR SU 81253890, covered an area of approximately 4.5 hectares. The earliest remains comprised a concentration of Mesolithic struck flints, much of this material recovered from the topsoil and subsoil. Evidence from similar sites in the vicinity suggests that the site was visited, perhaps repeatedly, by bands of hunter gatherers at various times in the Early and Late Mesolithic periods. 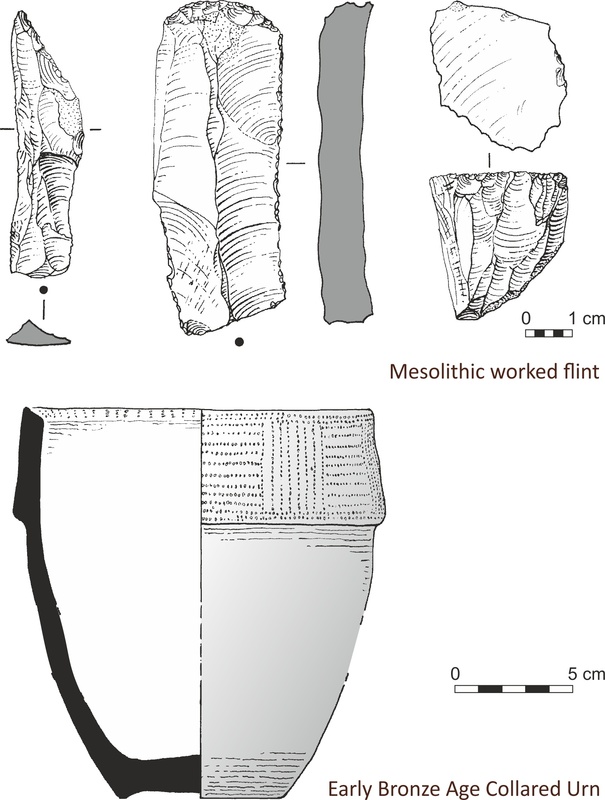 A single Early Bronze Age pit contained sherds of Collared Urn, but no human bone was found and there is no indication that the vessel – probably complete when placed in the pit – was associated with a burial. The Middle–Late Bronze Age settlement lay within a landscape that appears to have been extensively cleared. 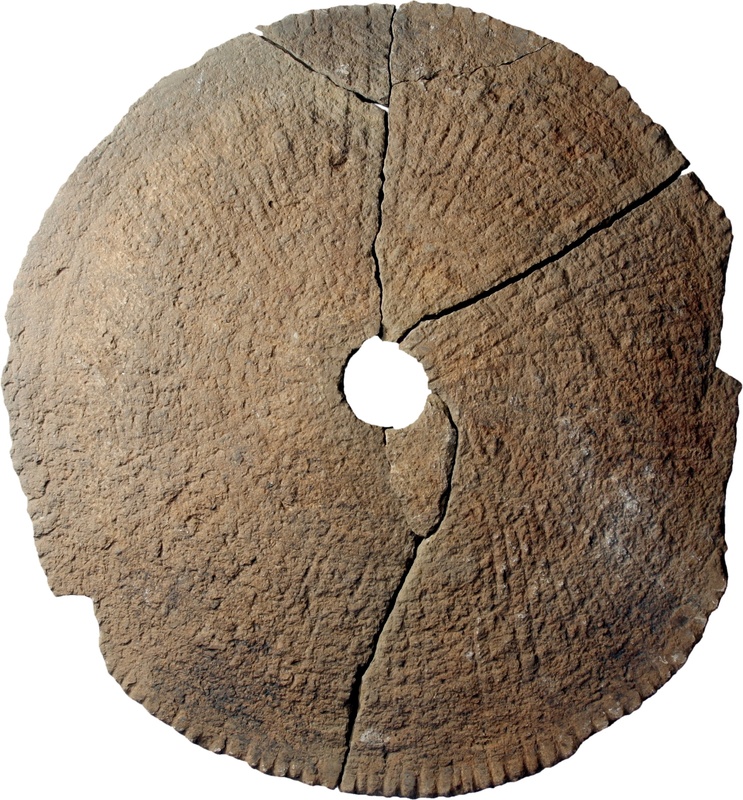 Although environmental samples contained very little evidence for cereal cultivation and processing, several fragmentary quern stones were recovered. The small quantities of animal bone surviving in the acidic soils make it impossible to draw firm conclusions on the levels of pastoral agriculture. However, the field systems which seem to have developed in the Late Bronze Age and Early Iron Age, associated here with trackways, are likely to have been related to animal husbandry. The settlement gradually shifted in focus over time, and where evidence for round-houses survived this comprised clusters of postholes associated with short lengths of drip gullies. At least one four-post structure and a six-post structure were also identified. It seems unlikely that settlement ever dense and it is probable that the excavated remains represent a farmstead, perhaps comprising a single extended family unit. Nevertheless, it appears that the settlement was long lived, with the pottery suggesting that the site was occupied from the Middle/Late Bronze Age through to the Middle Iron Age, although probably not continuously. The longevity of settlement is mirrored in the extended practice of burying pots in pits, with almost 30 examples at Groom’s Farm, an unusually large number. 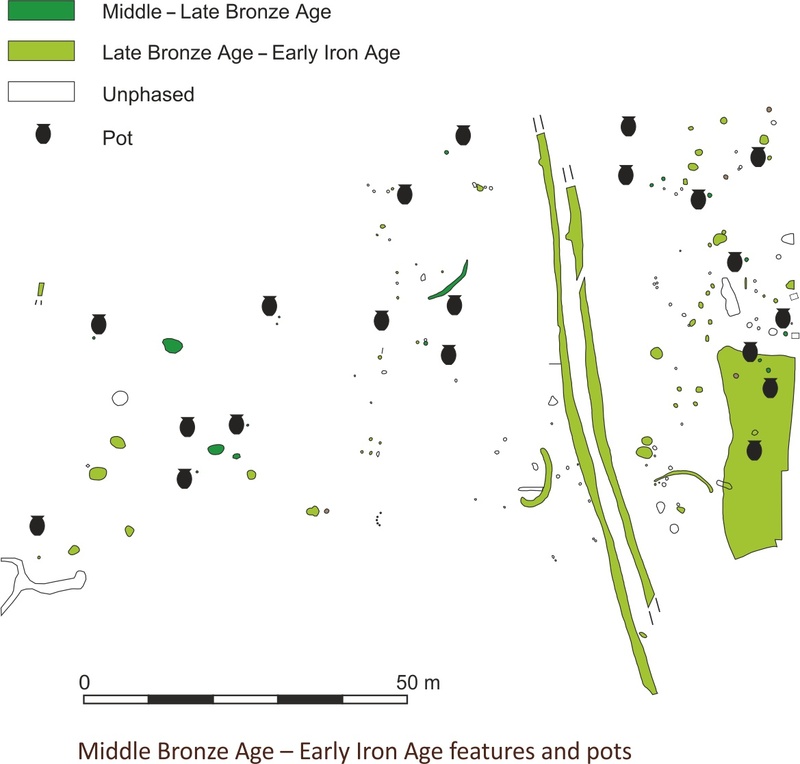 Their distribution follows a similar pattern from the Middle Bronze Age to the Early Iron Age, with most pits concentrated in a linear zone that does not correspond with any of the surviving late prehistoric boundaries. 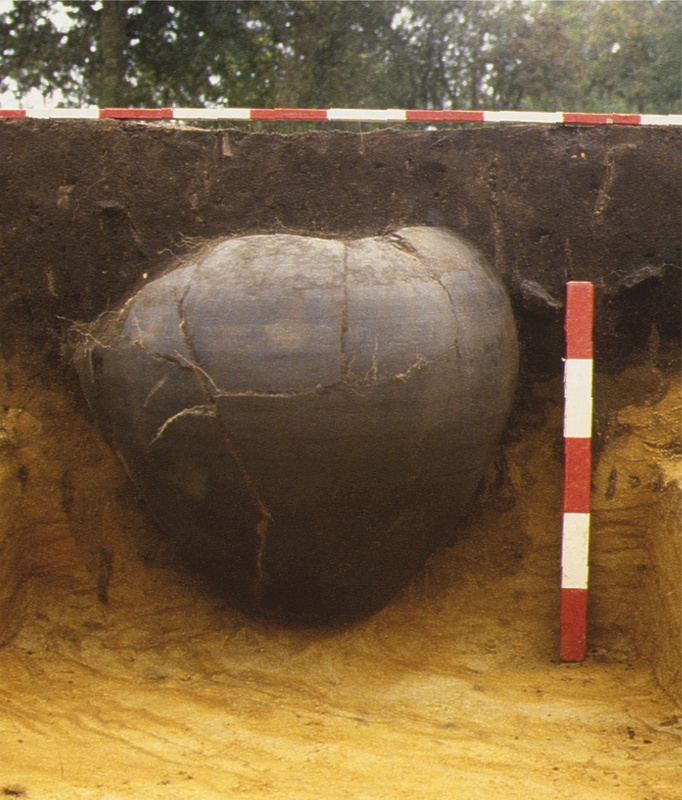 In only one case does the burial of a vessel have a clear funerary association, but there are a number of similarities between the pits, the pots and their contents which suggest that their deposition represents a long-term tradition. It is unlikely that pottery vessels were the only objects or materials being deposited, and at least some of the pots may have served as containers for some perishable commodity. Only in one pit were several other objects deposited, in this case two loomweights and a fragment of saddle quern. This group is interesting, as it includes items and debris which could be seen to represent key elements of the economy of the settlement: weaving, crop processing and possibly cooking, as well as the vessel itself. It seems reasonable to assume that the burial of the pots, along with whatever objects and materials were selected for deposition with them, represents some sort of propitiatory act. 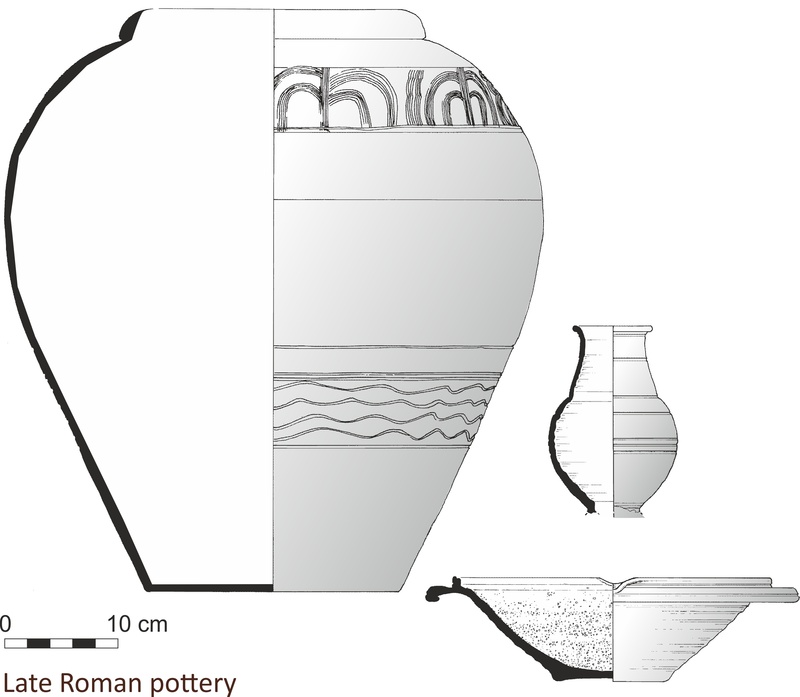 Large quantities of late Romano-British pottery recovered, together with the coins and radiocarbon dates, suggest that Romano-British activity at Groom’s Farm was relatively short lived and probably confined to the later 4th century AD. The main focus of this activity was the manufacture of pottery, forming part of the wider Alice Holt industry (Lyne and Jefferies 1979). One kiln was identified, comprising a single-chambered twin flue kiln, typical of those found in the area. Most of the vessel forms produced by this kiln (and possibly others nearby) can be paralleled within the published range for the Alice Holt kilns (e.g. Swan 1984 or Lyne and Jefferies 1979), as can the surface treatments and decoration, though there are minor variations in rim form, vessel profile, decoration and/or surface finish. It seems likely that the material comprising the various middens/spreads was largely derived from waste generated by the nearby pottery kilns. Charcoal analysis indicates the use of oak and hazel coppiced woodland to produce vigorous straight shoots as a fast-growing crop. The development of several erosion channels reflects a degree of instability on the sandy slopes during the Romano-British period, and local deforestation is likely to have been the cause. It is possible that four large late Romano-British storage jars buried in and around one of the midden/spreads may have been intended as a ‘closing’ deposit, marking the end of pottery production on the site. At least two of these vessels appear to have been buried with deposits of burnt material, and one of jars also contained two smaller pottery vessels (a mortarium and a beaker), whilst an iron axe had been placed in another. 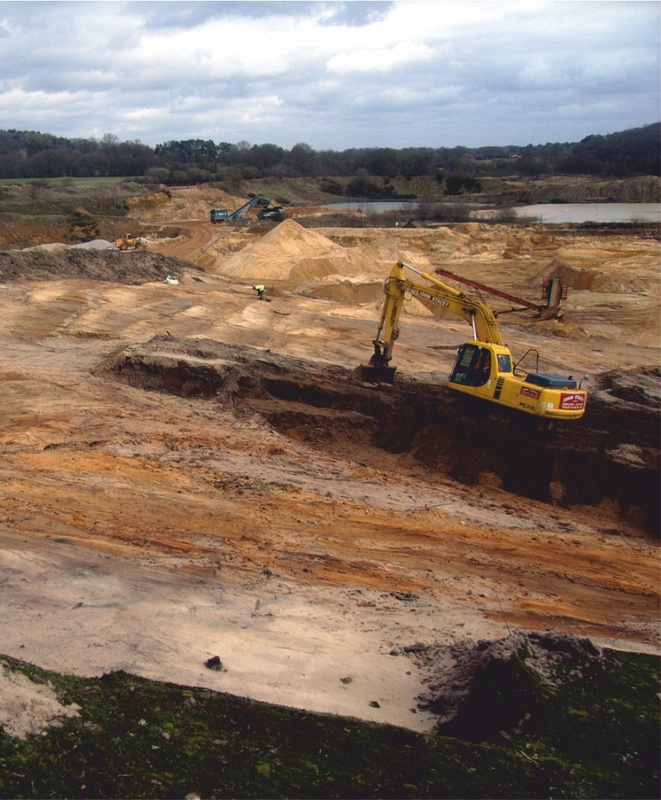 Wessex Archaeology would like to thank Grundon Sand and Gravel Ltd for commissioning the programme of archaeological work and for their assistance throughout the project. Thanks are also due to Hannah Fluck, Senior Archaeologist acting as advisor to Hampshire County Council, for her assistance and advice during the fieldwork. Read the full report here or download a pdf of the leaflet and report below.